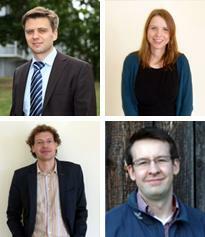 Oliver Refle, Jessica Günthel, Matthias Burgard and Raphael Adamietz from Fraunhofer- IPA will work on the following topics within NextFactory project: Development of 3D Micro- Assembly processes, Development of ultraprecise 3D Printing Process based on Inkjet-Technologies, Development of an overall process chain including assembly and printing steps as well as optical measurement and quality assurance steps, Technical and scientific coordination of the project. They expect to broaden their competences of process and system design in the field of Micro-Assembly. Furthermore 3D printing processes will be developed for new areas of application, especially in the field micromechatronic systems. Fraunhofer-IPA aims to develop a novel way of manufacturing microsystems, combining 3D printing and 3D assembly processes. Thus it will be possible to manufacture micromechatronic devices that are not feasible nowadays. This will lead to new fields of applications for Fraunhofer-IPA.